Brother and Sister Bear may have come up with their greatest idea yet: a super-duper dog show to be held at the Beartown church fair. Dogs large and small will do amazing tricks, and Dr. Hairball, the vet, will judge. The Arfo Dog Biscuit Company has even agreed to give out prizes to each and every dog. It’s sure to be the best dog show ever, or is it? Find out what happens when Too-Tall and the gang decide to crash the big show. 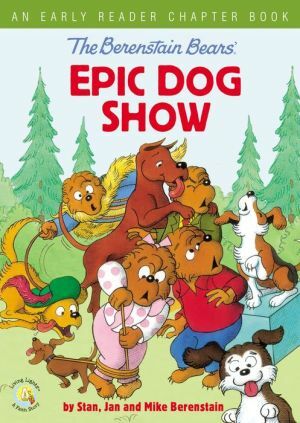 The Berenstain Bears’ Epic Dog Show is an engaging early reader chapter book that features black and white illustrations alongside entertaining text and relatable characters. As read-alone or read-aloud, it helps kids connect plot to chapter structure and will have teachers and librarians asking for more. And as part of the beloved Living Lights series, it’s the perfect segue for emerging readers and fans of the brand. When kids graduate from picture books to chapter books, it's a great moment. Mama, Papa, Brother, Sister, and Honey will captivate readers ages 6-10 who are ready to take the next step in their reading comprehension.